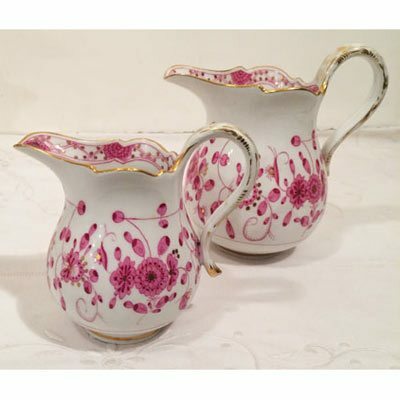 Elegant Findings Antiques has an extensive selection of Meissen purple Indian dinnerware. 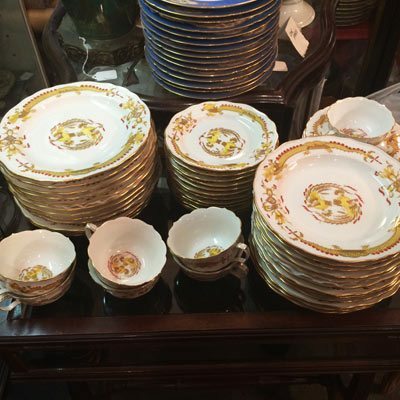 Elegant Findings Antiques offers you over 800 pieces of Meissen porcelain and dinnerware. 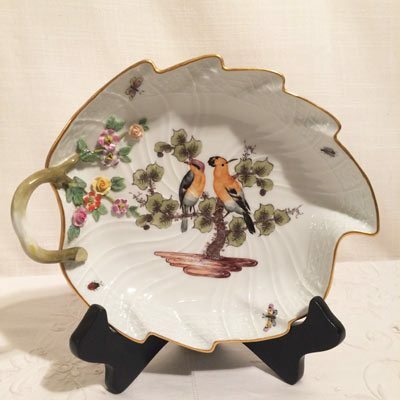 Most of our antique Meissen dinnerware dates back to the late nineteenth century. 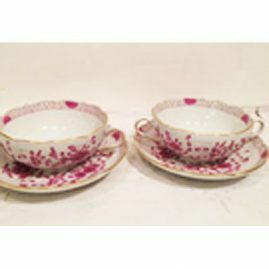 Elegant Findings Antiques also has an extensive selection of Meissen purple Indian dinnerware. Meissen purple Indian dinnerware is a beautiful pattern, and it makes a gorgeous service for your table. 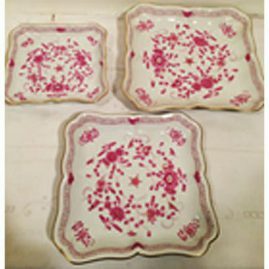 We have many pieces for you to choose from for your table. 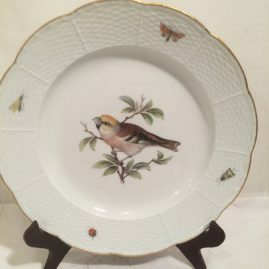 We have dinner plates, wide rim soup bowls, luncheon plates, bread plates, cream soups and saucers, and cups and saucers. 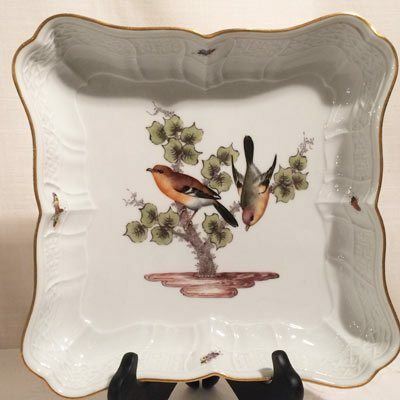 We also offer a wide selection of serving pieces like many oval platters, many round platters, many round and oval serving bowls and gravy boats with attached under plates. 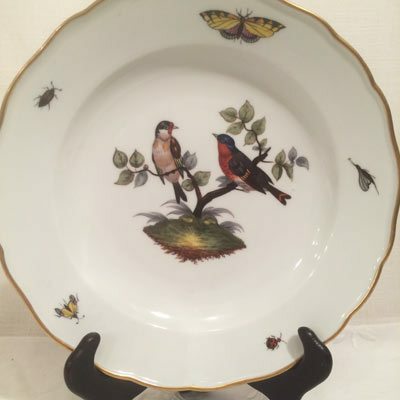 We have many wonderful Meissen dinner services including Meissen with large bouquets and bugs called New Brandenstein. Each bouquet is free hand painted and every piece is painted with different bouquets of flowers. The detail of the flowers and the leaves is amazing! 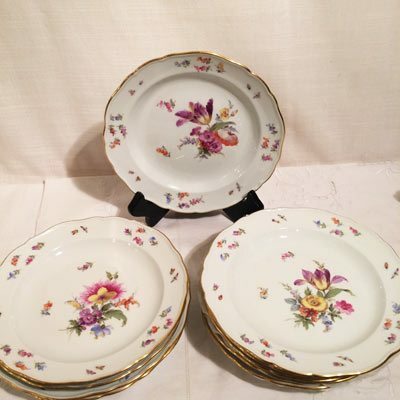 We also have a large selection of Meissen streublumen dinnerware. This pattern stands for thrown flowers. It was a tradition in Germany to throw flowers at the bride at the wedding. 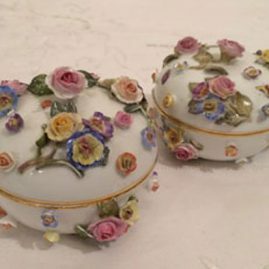 When people threw the flowers, the flowers would land in different patterns each time they were thrown. 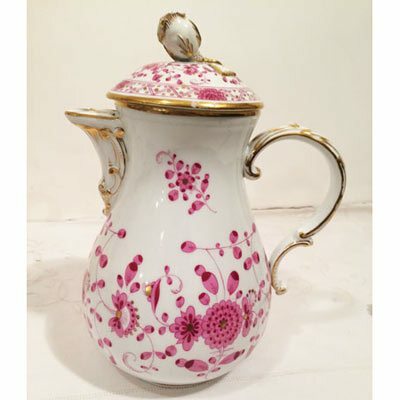 Therefore, each Meissen streublumen piece is painted with different flowers. 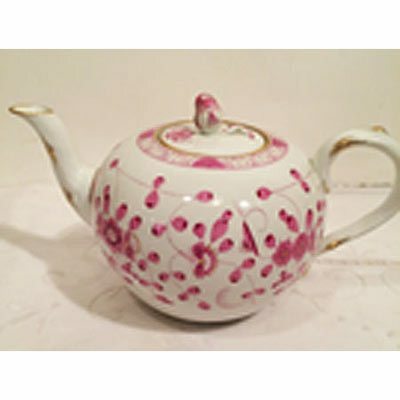 We also have an extensive selection of blue onion Meissen porcelain and dinnerware.If you look on page 12 or page 13, you will see many of the rare examples of Meissen blue onion for you to choose for your collection. 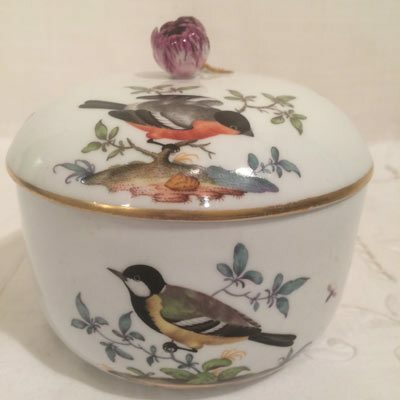 We are lucky to have many rare pieces of Meissen blue onion at this time. Please read my blog on the history of Meissen blue onion porcelain. 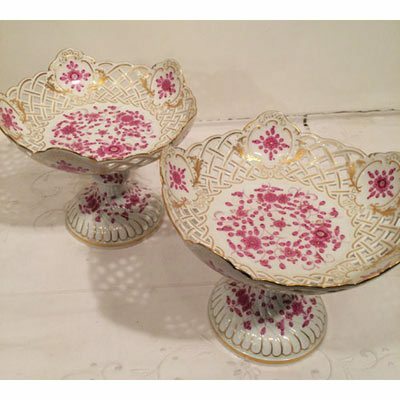 We also just received a rare set of Meissen pink onion dinnerware. 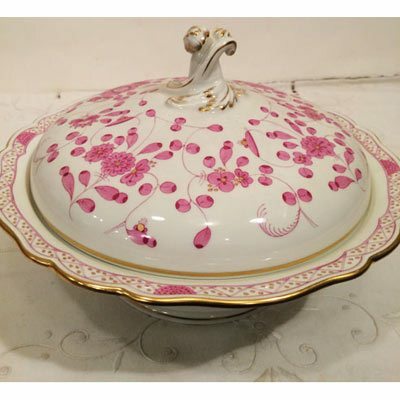 We have only had one piece of Meissen pink onion over the past thirty years. 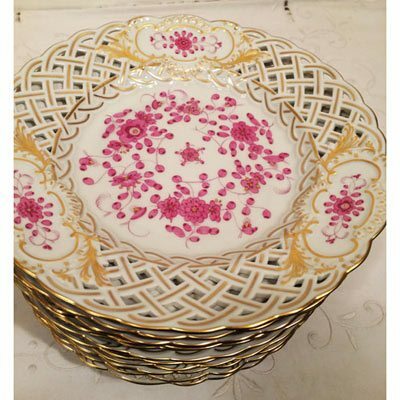 We are very happy to offer you this rare set at this time. Other Meissen porcelain dinner services that we have in stock are a set of yellow court dragon and another set of green court dragon. 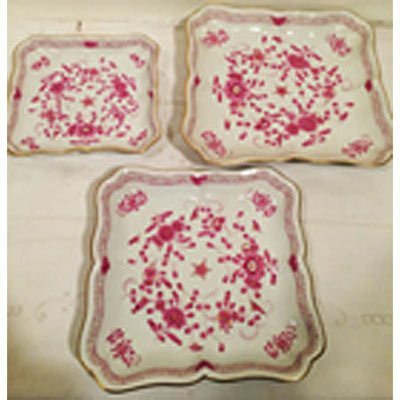 Elegant Findings Antiques also has fruit plates where each fruit is painted differently. We also offer you many Meissen cabinet plates, vases, cups and saucers, tureens and figurines. Please check our website at elegantfindingsantiques.com to find rare Meissen porcelain and dinnerware for your collection. 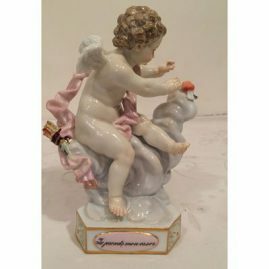 Meissen angel putting a heart with wings in a cloud.. Je prends mon essor. 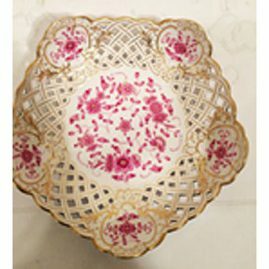 Circa-1880s, 6 inches tall by 4 inches wide.Price on Request. Set of ten Meissen rare cream soups and saucers, two handled soup bowls. soup bowls-7 inches wide by 2 inches deep. Saucers 6 3/4 inch diameter. Price on Request. 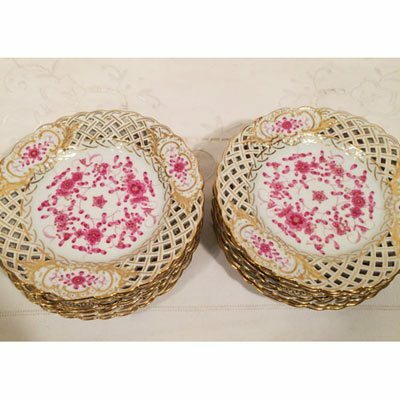 Set of twelve Meissen purple Indian reticulated breads or appetizer plates. Circa 1880s. Diameter 6 inches. Sold. Set of 11 rare Meissen reticulated purple Indian dessert or luncheon plates; diameter is 8 1/2 inches, Sold. Meissen figurine of lady smelling flowers representing the sense of smell. Circa-1910. Height-6 1/4 inches and width 4 1/4 inches. Sold. 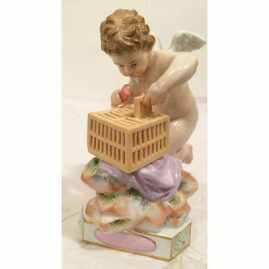 Meissen cherub figure of cherub putting heart in cage, titled je le captive. 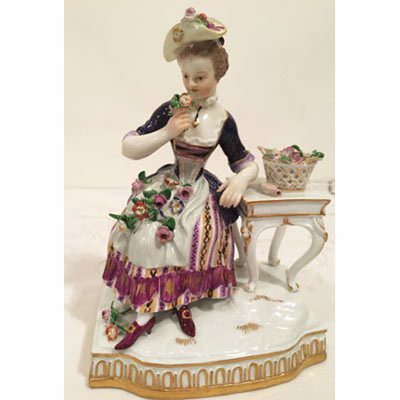 Circa- 1880s, Height- 5 inches tall and 3 1/2 inches wide. Price on Request. Meissen purple Indian covered bowl or vegetable. Width 11 1/2 inches by 9 inches tall. Sold. Two Meissen purple Indian creamers. First creamer is five inches tall, second creamer is six inches tall. Circa-1880s. Sold. Meissen purple Indian coffee pot with rose on top. Sold. Meissen purple Indian reticulated and fluted bowl, diameter is 7 1/4 inches, Circa-1880s, Sold. 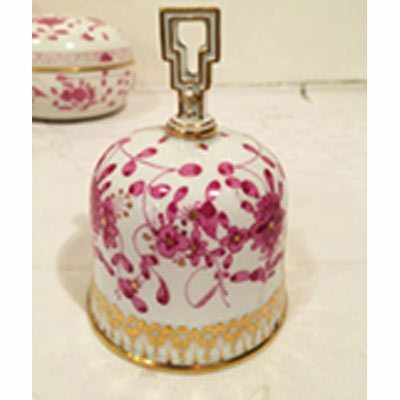 Meissen purple Indian bell. 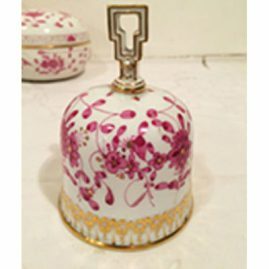 Circa-1880s, 4 1/2 inches tall. Sold. Meissen yellow court dragon dinner set including 12 luncheon plates, 8 3/8 inch diameter, twelve dessert plates, 7 7/8 inches, 12 bread plates, 6 3/8 inches and 7 cups and saucers. Prices on Request. 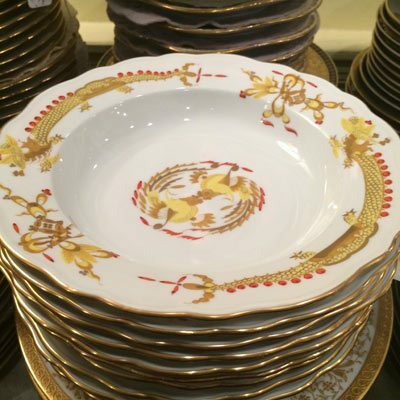 Twelve Meissen yellow court dragon dinner plates and 10 wide rim soups. Dinners are 10 inches in diameter and wide rim soups are 9 1/4 inches in diameter. Prices on Request. 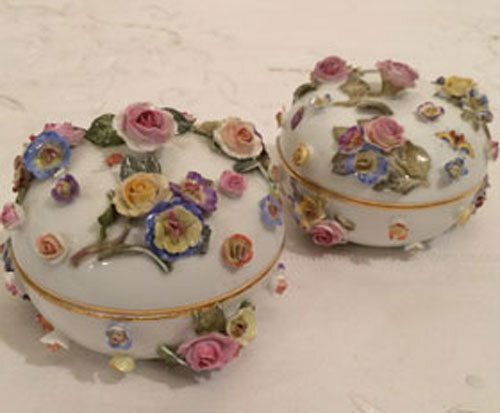 Rare Meissen boxes with raised flowers, Ca-1880s, Sold. 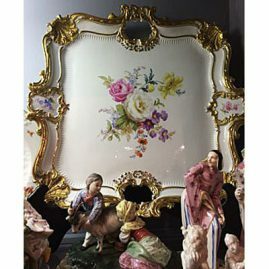 Large Meissen square tray. Late 19th century. Size 16 inches. Shell decoration. Price on Request. Meissen bowl painted with birds and bugs. Diagonal measurement-12 3/4 inches, by smallest measurement in center-9 by 9 inches. Circa-1860s-1870s. Sold. 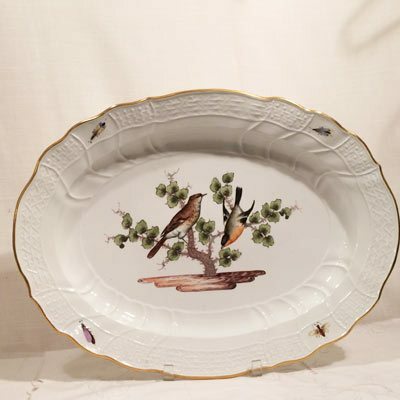 Rare large Meissen platter painted with birds and bugs. Length-19 3/4 inches by 14 3/4 inches tall. Circa-1860s-1870s. Sold. Meissen leaf shaped dish painted with birds and bugs and having raised flowers around the handle. 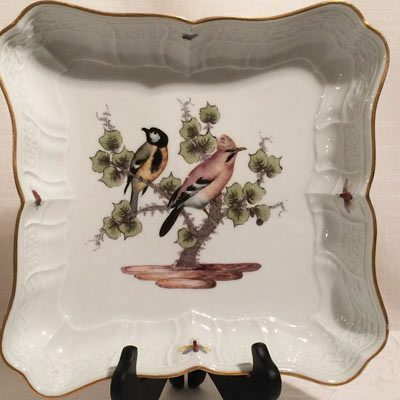 We have two leaf dishes in stock, each painted with different birds. Circa-1870s-1880s. Width-8 1/2 inches by 7 inches long. Sold. 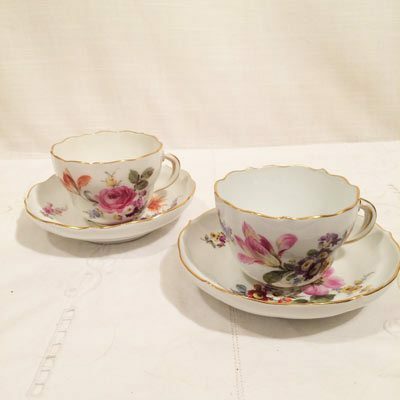 Set of 10 Meissen cups and saucers each painted with different flower bouquets. Circa-1880s. Price on Request. Set of ten Meissen dessert plates, each painted with different flower bouquets and bugs. 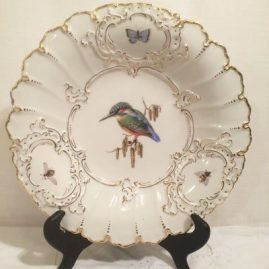 Circa-1880s-1890s. Diameter-8 1/8 inches. Price on Request.